Heavy rain this morning and squally winds this afternoon.The quality of the light was poor all day After dark, the wind and rain eased off and I took the opportunity to use my new Petzl head torch. It’s a leap of faith if you can’t see exactly where you are placing your feet at night but the head torch provides sufficient strong light to illuminate a wide angle of the path. That means you can run more confidently. 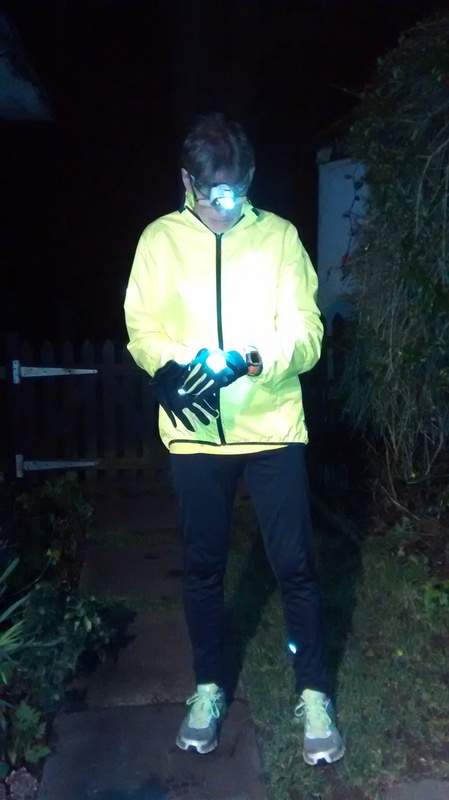 I don’t worry about running on a poorly lit pavement but a good torch makes for a more relaxing outing. Distance about 3.4 miles. Saw one other runner with a head light. I subscribe to Heart Matters, the British Heart Foundation magazine which is free. https://www.bhf.org.uk/heart-matters-magazine. It’s very informative, easy to read, discusses all aspects of heart disease and treatment and is full of positive and inspiring stories. This month it features explorer Sir Ranulph Fiennes who had a heart attack in 2003 and had to be resuscitated from several cardiac arrests. Following bypass surgery, three months later he ran seven marathons in seven days on all seven continents. In 2005, he climbed Everest and got within 300 metres of the summit before chest pains stopped him going to the top. According to his surgeon, Professor Angelini, who raised no objection to these endeavours, “his heart has recovered ; there was no damage.” Professor Angelini did advise him his heart rate should not rise much above 130 beats per minute. Fiennes went on to successfully climb Everest on his third attempt in 2008. He is now aged 71. Last year he completed the Marathon De Sables, an extremely demanding 251k race across the Sahara desert. The article seems to be a puff for super hero Fiennes whose cardiac arrests, bypass surgery and heart disease appear not to have had any impact on his ability to undergo extremes of physical endurance. No mention of medication although NICE guidelines seem to put everyone on Ramipril, bisoprolol, aspirin and statins following a heart attack. Ranulph, why are you different? Is it because you are a knight of the realm and strong blue blood courses through your veins? I’ll be contacting Heart Matters and HRM Queen Elizabeth over this. This entry was posted in Am I Being Unfair?, cardiac rehabilitation, Exercise and heart disease, Heart disease, Janathon, miserable weather, Running, running with heart disease, SAD, Uncategorized and tagged British Heart Foundation, exercise, heart disorder, Heart Matters magazine, Janathon, running, running head torches, Sir Ranulph Fiennes. Bookmark the permalink. You are mistaken! I do not look like a minion. I look like a Greek running god condescending to test a head lamp. How sensible can it be for Sir Ranulph Twisleton-Wykeham-Fiennes to be running 7 marathons in 7 days and climbing Everest 3 months after several cardiac arrests and heart bypass surgery.Is it possible that his heart is undamaged? He seems to have a cosy relationship with a top cardiologist.